Shown here is a close up of the cartouche with partridges. 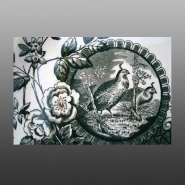 An oval earthenware platter printed in greenish black with the Chatsworth pattern. The gilt decorated rim shows some wear. The name of the pattern appears in the mark shown above. The factory produced more than one version of this pattern varying the number of cartouches included in the design and they printed it in more than one color. On this platter two cartouches are seen; one with a pair of woodland partridges, the other with three birds singing and flying. The floral spray partial border at the bottom of the piece is made up of intertwining flowers.